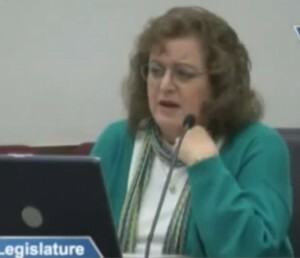 CBS4’s investigative reporter, Brian Maass, discovered that Democratic Sen. Evie Hudak would rather update her Facebook page, surf the web, and send out off-topic tweets than pay attention to important hearings. This time, the hearing was a two-day hearing on Colorado’s Corrections Department and Parole Division. You can watch the full Maass’ expose on Hudak’s lack of regard for the hearing in which she’s sitting here. Don’t miss this Must See TV. So, the alternative here is that Hudak either plays on Facebook or she falls asleep? The other legislators who attended this hearing seemed engaged, as they should since Hudak and her colleagues are on the taxpayers’ dime. Could Hudak be any more disgraceful to the taxpayers and the serious process in which she’s supposed to participate? It also wasn’t the first time Hudak has been caught ignoring serious testimony at the Capitol. It would seem that it doesn’t matter what the topic the hearing is covering – nothing gets in the way of Hudak and her web surfing. She gets paid for this? Time for some change! Maybe she needs to smell the sweet smell of RECALL! If we all went to work and did our jobs this way…we would be fired. Where I work the cell phone can't even be on the floor with us. Hudak has to GO! Color her gone…Another Worthless POS!